When not rented out for private events, the stools will be stowed away, tables raised to hip height to create a seat-less bar scenario for the menu of flavored milks, cookies, soft serve, pastries, etc. 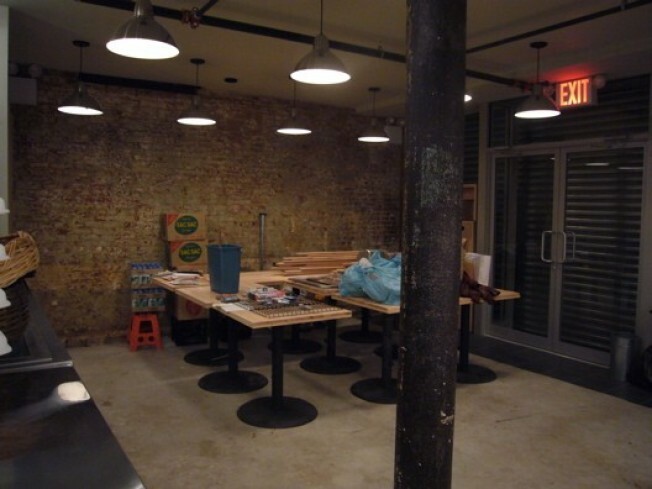 Tables will be configured in either rows or L-shapes, with a long bar spanning the back brick wall. Unlike what they've got going on over at the Noodle Bar and Ko, there will be no seating by the open kitchen and Christina Tosi's ovens. As for her kitchen, one side is devoted to the ovens while the other features two soft serve machines and a custom built display case divided into two sections kept at two different temperatures. And when someone does rent it out? Tables are lowered and configured however the guest wants them—long rows, a banquet-style square, L's, etc—and both bakery and Ssam menus will be available. From the above shots, the space may not look ready for a Friday debut, but they already pulled off a successful initial run over the weekend. Click through to see how it went.